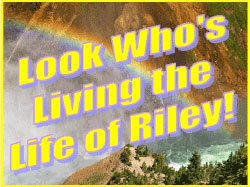 *** WINNERS *** Robyn, Allison, Rita and Kate are Living the Life of Riley! CONGRATS! I want to give a big and hearty CONGRATULATIONS to Robyn, the winner of the "I Am T-Pain Mic" from JAKKS Pacific! Robyn now has 48 hours to confirm! I also want to give a big and hearty CONGRATULATIONS to Allison, the winner of the VIOlight UV Cell Phone Sanitizer! Allison now has 48 hours to confirm! I also want to give a big and hearty CONGRATULATIONS to Rita, the winner of the Carmex Healing Lotion and Healing Cream Prize Pack! Rita now has 48 hours to confirm! I also want to give a big and hearty CONGRATULATIONS to Kate, the winner of the Optari Backpack and 2 Mini Fobbz of Choice! Kate now has 48 hours to confirm! *** WINNERS *** Laura, John, Jennifer and Angella are Living the Life of Riley! CONGRATS!